SUMMARY: Amyloidomas are benign tumorlike lesions consisting of localized deposits of amyloid and are the rarest form in the group of amyloidosis-related lesions. Diagnosis requires special stains; therefore, a high degree of suspicion for this disease is required. 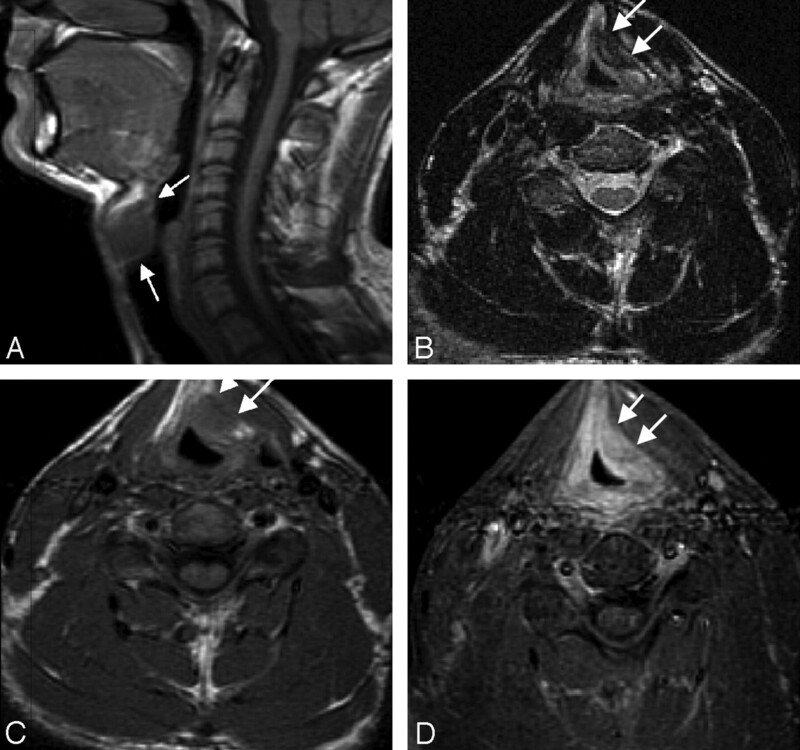 In this review, we describe the imaging features of amyloidomas involving the intracranial compartment, head and neck, and spine. We also discuss the differential diagnosis and briefly review the pertinent literature. Amyloidosis is a disease complex resulting in the extracellular deposition of waxy insoluble fibrillar protein material called “amyloid.” It was first described by Rokitansky in 1842.1 Amyloid consists of relatively insoluble fibrils composed of polypeptide chains arranged in a twisted ß-pleated sheet configuration. This particular protein configuration accounts for its characteristic staining properties and permits identification by light microscopy. It imparts unique chemical properties like resistance to protease digestion and insolubility, which promote continued deposition within organs. While amyloid can be suspected on routine hematoxylin-eosin sections, special stains are important for definitive diagnosis. With the polarized microscope, amyloid is seen to have a green birefringence when stained with Congo red. Several amyloid accumulations have been shown to have coexistent plasma cells.22–24 In an immunochemical and biochemical study, Vidal et al25 showed that the amyloidoma is related to a benign clonal proliferation of the plasma cells. Whether a solitary plasmacytoma can evolve from an amyloidoma remains to be determined.24 Laeng et al26 found immunoglobulin H gene rearrangement in 2 of 7 cases of nervous system amyloidomas, suggestive of an underlying B-cell neoplasia. We evaluated 8 patients (3 men, 5 women; age range, 27–62 years) with amyloidoma involving the brain, head, neck, and the spine during 5 years. Clinical findings as well as laboratory test results were made available in all patients. CT scans (n = 6) and MR images (n = 5) were obtained in all the patients. All patients had surgical procedures, in the form of either complete excision or biopsy; and all cases were shown to be amyloidoma on pathologic examination. Amyloid deposition within the brain can take many forms, including cerebral amyloid angiopathy, senile plaques of Alzheimer dementia, and deposits seen in the spongiform encephalitides of Kuru, Gerstmann-Straussler syndrome, and Creutzfeldt-Jacob disease. Tumorlike deposition (amyloidoma) is the least common form, with few previously reported cases.8 Notably, central nervous system amyloidomas are a different entity from systemic amyloidosis or from the more common congophilic amyloid angiopathy.27 They occur in isolation and have no known etiologic factors. The average patient age at presentation with cerebral amyloidoma is 47.8 years, and there is a slight female preponderance. Presenting features include seizures, headache, focal motor deficits, and cognitive decline. The mass usually is supratentorial, with only 1 reported case of simultaneous cerebral lobar and pontine involvement.27 On imaging, cerebral lobar white matter is most commonly affected, with occasional involvement of the cortex. Single and multiple lesions occur with similar frequency. These masses are iso- to hyperattenuated on unenhanced CT (Fig 1A). Hypointensity or mixed signal intensity on T2WI (Fig 1 B) and iso- to slight hyperintensity on T1WI (Fig 1 C) are observed due to nonuniform deposition of protein. The marked enhancement following contrast administration (Fig 1 D) is secondary to the disruption of the blood-brain barrier, attributed to the amyloid involvement in the blood vessel walls. Intracranial amyloidoma in a 54-year-old woman with 2 episodes of left-hemispheric seizures. 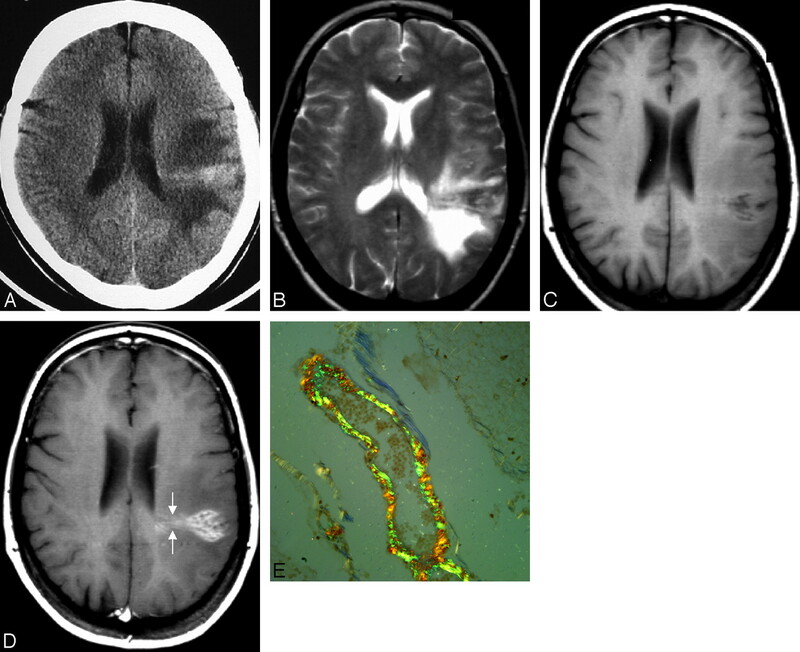 Axial CT scan of the head without contrast (A), axial T2-weighted image (B), axial T1-weighted image precontrast (C), axial postcontrast T1-weighted image (D), and a histopathologic section stained with Congo red (E). CT (A) shows a hyperattenuated mass in the deep white matter with medial extension up to the lateral ventricular ependyma. On MR imaging (B−D), the mass is iso- to hypointense on T1WI and T2WI and reveals marked enhancement on postgadolinium T1WI. D, Note the fine radiating lines at the medial aspect of the tumor (arrow), which are thought to be due to deposition of amyloid along the blood vessels, a finding frequently observed on histopathology. E, Courtesy of Mila Blaivas, University of Michigan, Ann Arbor, Michigan (Congo red, original magnification ×100). This same phenomenon is described in scintigraphic studies by using technetium Tc99m pertechnetate.8 Usually, there is lack of vasogenic edema and mass effect on surrounding structures. Cerebral angiographic results are normal, or they reveal vascular displacement by tumor. Most interesting, fine irregular radiating lines at the edge of the tumor have been described in some published cases (Fig 1 D).8 These lines may indicate deposition of amyloid along the blood vessels, probably small-sized arteries, a finding that has been observed in pathology specimens (Fig 1 E).28 Primary amyloidomas, though rare, should be included in the differential diagnosis of intra-axial masses that show little or no mass effect, are hyperattenuated on nonenhanced CT and hyperintense on T1WI, and show avid homogeneous enhancement with contrast. Clival amyloidoma in a 45-year-old woman with left facial numbness and pain for 1–2 months. MR imaging of the skull base shows a mass involving the left clivus. The mass (arrows) is hypointense on T2WI (A) and shows homogeneous enhancement with contrast (B). Localized amyloid deposits have been described in a variety of sites in the head and neck, including the orbits, nasopharynx, lips, floor of mouth, tongue, larynx, and tracheobronchial tree.2–11,17–19 The imaging features are nonspecific. As opposed to amyloidomas of the larynx, the amyloid tumors at other head and neck sites generally have a more aggressive appearance. Laryngeal amyloidoma in a 27-year-old man with long-standing juvenile rheumatoid arthritis and progressive hoarseness. Sagittal T1-weighted image (A), axial T2-weighted image (B), axial T1-weighted image (C), and axial postcontrast with fat-saturation T1-weighted image (D) demonstrate a 15-mm left supraglottic submucosal mass (arrows), which is isointense to muscle on T1 and enhances homogeneously with contrast. This lesion has notable decreased signal intensity on the T2WI, suggestive of an orderly matrix with little free water. The lesion was pathologically proved to be amyloidoma. The patient did not have any evidence of systemic disease. Courtesy of Steve Gebarski, University of Michigan, Ann Arbor, Michigan. Orbital amyloidoma in a 32-year old woman with a slowly increasing mass in the right orbit and generalized bone pain. A, CT scan of the orbits shows a large mass involving the right superolateral orbit. B, The sclerotic/calcified mass involves the right frontal bone and the right lacrimal gland. Thoracolumbar spine amyloidosis in a 54-year-old woman with back pain for a few-months' duration. Coronal and sagittal reformatted CT scan of the thoracolumbar junction reveals an irregular soft-tissue mass at the superior endplate, causing mild underlying sclerosis. The patient was initially treated for infection, but because there was no response, it prompted biopsy and amyloidosis was found. Sometimes, localized deposits of amyloid appear as densely calcified lesions on CT and plain films (Figs 6A, -B and 7 A, -B). They commonly extend into the soft tissues. Findings mimic chondrosarcoma, osteogenic sarcoma, or calcified metastatic tumor. Amyloid deposits show intense uptake of bone radiotracer because of the associated ectopic ossification and calcification. The MR imaging signal-intensity characteristics are similar to those of primary amyloid lesions elsewhere in the bones and soft tissues and include low-to-intermediate signal intensity on T1WI, intermediate-to-low signal intensity on T2WI, and variable enhancement on contrast-enhanced T1WI. Thoracic spine amyloidoma in a 45-year-old woman with progressive back pain and lower limb paraparesis. 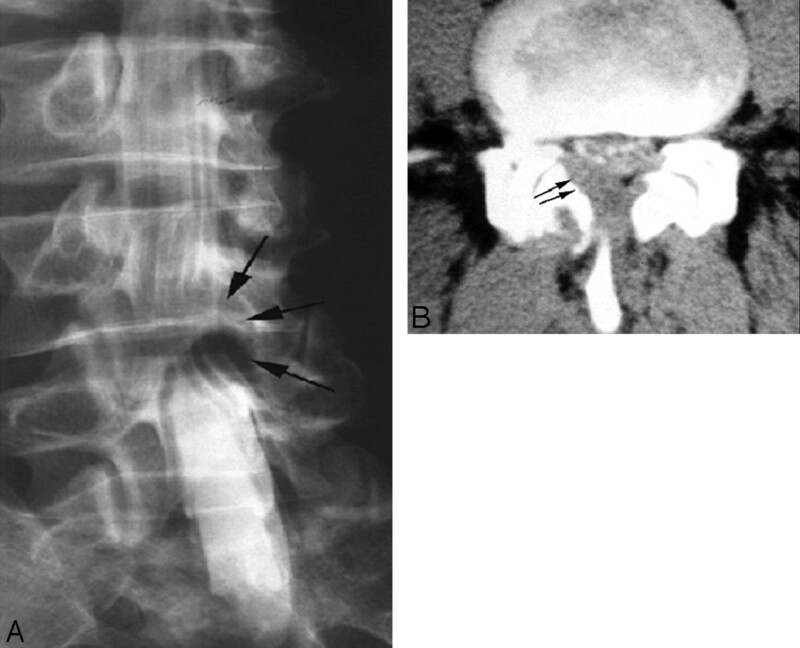 A, Prone-oblique lumbar myelogram reveals an extradural mass at the level of the L4 vertebral body posterolateral to the thecal sac (arrows). B, CT myelogram at the same level shows a mass (arrows) in the ligamentum flavum, which was initially thought to be a synovial cyst. This turned out to be amyloidoma of ligamentum flavum. There was no evidence of systemic amyloidosis or plasma cell dyscrasia. Pelvic bone involvement in a 62-year-old man with chronic low back pain radiating to the right lower extremity. Axial CT scan of the pelvis (A) and shaded-surface display (B) show a large destructive mass with exuberant calcifications involving the right ilium and sacrum (arrows) in a patient with multiple myeloma. Note the extension of the tumor into the sacral neural foramen on the right side. Multiple biopsies failed to demonstrate any plasma cells in this mass. Pathologic diagnosis was consistent with an amyloidoma. 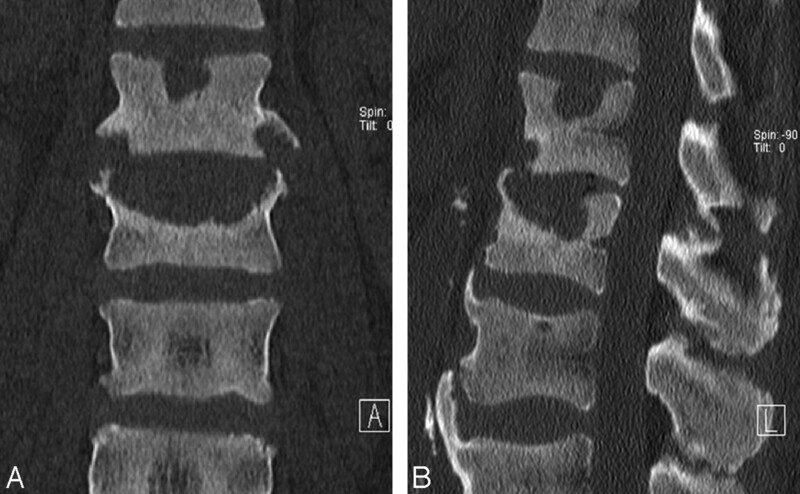 Spinal MR imaging in a 44-year-old woman with progressive numbness and weakness of all 4 extremities and mild autonomic dysfunction. 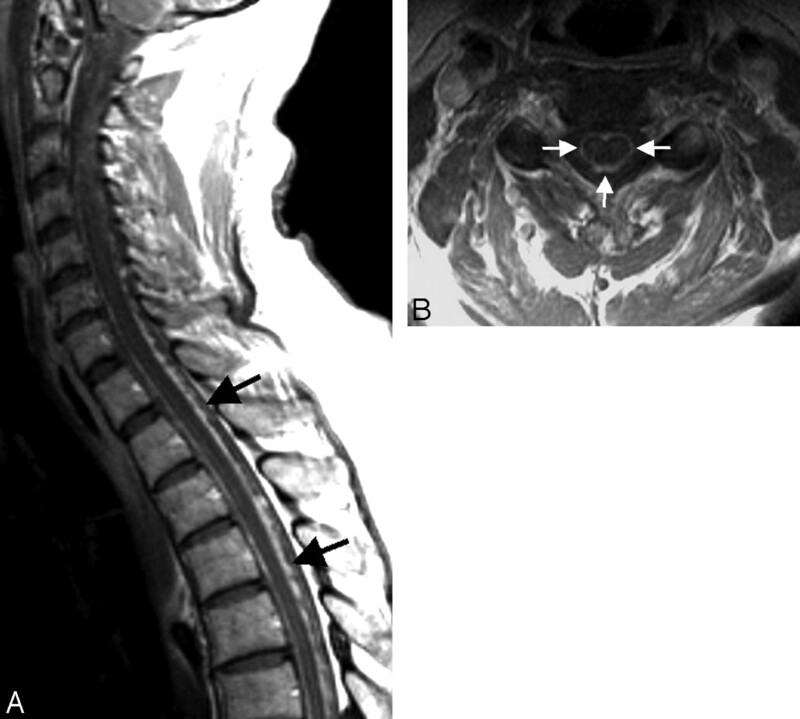 Sagittal and axial postcontrast-enhanced T1-weighted image shows extensive pial enhancement, completely coating the surface of the cervical and thoracic cord (arrows). Amyloid deposits were found at biopsy. Amyloidomas are slow-growing benign lesions that generally have a favorable prognosis as opposed to systemic amyloidosis. Complete evaluation should be performed in every patient to exclude associated systemic amyloidosis and plasma cell dyscrasia. Imaging features are variable and can mimic slow-growing neoplasms in the brain and head and neck. Intracranial amyloidoma should be considered in solitary or multiple masses with little or no mass effect, hyperattenuation on CT scans, and variable T1 and T2 signal intensity with homogeneous enhancement with contrast. Amyloidomas in the orbits and larynx are well-defined masses with benign imaging features, but lesions elsewhere in the head and neck and spine and at the skull base often show aggressive features and can mimic aggressive diseases like infection or malignant neoplasm. Previously presented as a scientific exhibit at: Annual Meeting of American Society of Neuroradiology, May 16–21, 2009; Vancouver, British Columbia, Canada.